A National Arboretum introduction, Natchez Crapemyrtle is a cross between Lagerstroemia indica ‘Pink Lace’ and the first L. fauriei brought from Japan, this was done back in 1964. After much evaluation the cultivar was finally released in 1978. 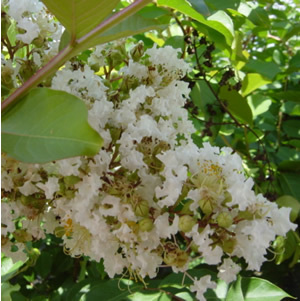 This vigorous cultivar blooms from June through September for roughly 110 days revealing beautiful tiny white flowers, it can have up to 100-800 flowers per inflorecence, that are offset by stuning cinnamon colored bark. The Natchez Crapemyrtle has dark green oblong leaves that turn orange and red in the fall. This towering Crapemyrtle grows to a height of 20 to 30 feet with a crown spread of 35 feet at maturity. It is tolerant to heat, humidity, and powdery mildew.